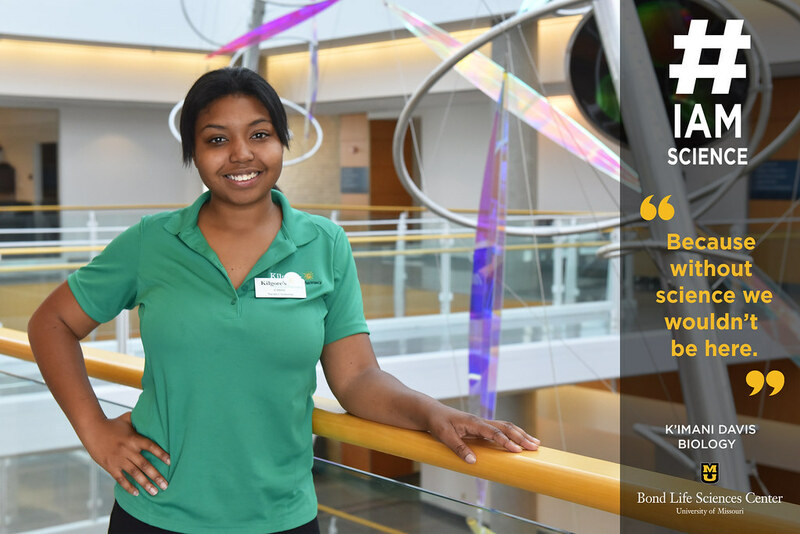 One class changed senior K’Imani Davis’s mind, who is now going into her senior year working in the Anand Chandrasekhar lab at Bond LSC. After Davis’s change of heart, she decided to start out at MU as a biology major, and she is now going the pre-med route. Just like Davis ended up in science, she ended up at MU by chance. Davis came to MU knowing nothing about the campus, programs or any students. And then she stumbled across an opportunity that changed her college experience for her. From freshman year to now, Davis has found a home away from home in her lab. Davis didn’t just find a family at Bond LSC, she found her passion. The lab is studying neuronal migration in zebra fish. This study looks at how neurons move into place as the brain and nervous system develops with the hope of learning how the process works and using that information to understand neuro-degenerative disease. In her freshman year when Davis was an intern in the lab, she fed the fish and cleaned the tanks. Now, she analyzes fish behaviors and compares swim patterns between wild and mutated zebra fish. “By analyzing their behavior, we are able to see if there are neuronal migration patterns, and we see what defects leads to different behaviors,” Davis said. Davis’s goal for this upcoming year is to have a poster of her research to display to others. Her experience at MU has brought her a family, a passion and no longer a hatred for science. “I think everything happens for a reason,” Davis said. Almost two-thirds of what makes a human a human and a fly a fly are the same, according to the NIH genome research institute. If recent research at the University of Missouri’s Bond Life Sciences Center is verified, we’ll soon see that plants and mice aren’t all that different, either. Dan Leuchtman studies a gene in Arabidopsis plants called SRFR1, or “Surfer One.” SRFR1 regulates plant immune systems and tell them when they are infected with diseases or illnesses. Leuchtman studies this model plant as a Ph.D. candidate at MU, splitting time between the labs of Walter Gassmann and Mannie Liscum. His research involves breeding Arabidopsis plants missing the SRFR1 gene and then replacing it with the MmSRFR1 gene. So, what is MmSRFR1? Leuchtman and company believe it’s the animal equivalent of SRFR1, though they aren’t fully aware of all of its’ functions. “We’re actually one of the first groups to characterize it,” Leuchtman said. While his experiments haven’t created statuesque plants equal to those with natural SRFR1 genes present, the Arabidopsis plants with MmSRFR1 show a notable difference from those completely lacking SRFR1. Leuchtman says the plants with MmSRFR1 lie somewhere in between a normal plant and one lacking SRFR1. Roger Meissen/Bond Life Sciences Center – These soybean roots show some nematode cysts. The small, white circles are the hardened body of the nematodes and form when the nematode attaches itself to the root to create a feeding cell. Beneath a North Carolina field in 1954, a tiny worm inched its way through the soil and butted against a soybean root. The worm pierced the plant, slipped inside and inserted a needle-like appendage into a cell. It pumped a mixture of proteins into the root cell and waited for the potent blend to take effect on the unsuspecting soybean. Since the first detection of soybean cyst nematode (SCN) in the US, the worm Heterodera glycines has spread to about 80 percent of American soybean fields. In Missouri, SCN attacks soybeans in almost every county and causes decreased yields even in robust, healthy-looking fields. Nationwide, SCN wreaks havoc to the tune of $1.2 billion per year, making it by far the most costly soybean pest. Despite the hefty toll, farmers still depend on the same small handful of resistant soybean varieties to combat SCN that they have used for years. But those natural defenses are becoming less effective as nematodes evolve. But in the past 10 years, researchers studying SCN have made numerous breakthroughs, unlocking the secrets of the nematode and exploring how the worm interacts with host plants. Now, scientists are poised to bring that knowledge from the laboratory to the field. Relatively little was known about SCN a decade ago. Scientists could determine the type of nematode in a soil sample and had just figured out the cocktail of proteins a nematode pumps into the soy root cell that transform it into a syncytium, or feeding cell. Working in part with funding from commodity boards and farmer checkoff dollars, researchers around the country made breakthrough after breakthrough, deepening our understanding of SCN and equipping scientists with new tools to fight the pest. That money helped scientists sequence the soybean genome, draft a SCN genome and pinpoint important soy and SCN genes. Checkoff investments continued to pay dividends in 2012 when Mitchum and colleagues cloned the first gene linked to natural soybean cyst nematode resistance. This breakthrough is one key step in moving science from the laboratory into the field. With a SCN resistance gene in hand, new avenues for creating soybean varieties that fight off the nematode are opening up. But other areas of research also hold promise in the struggle against soybean cyst nematode’s parasitic ways. Mitchum’s group also identified the plant receptors that recognize and respond to the blend of proteins an attacking nematode inserts into a plant. In a recent project published in Plant Biotechnology Journal, Xiaoli Guo, a postdoctoral fellow in Mitchum’s lab demonstrated that silencing those receptors in soybean roots helped the plant resist SCN. 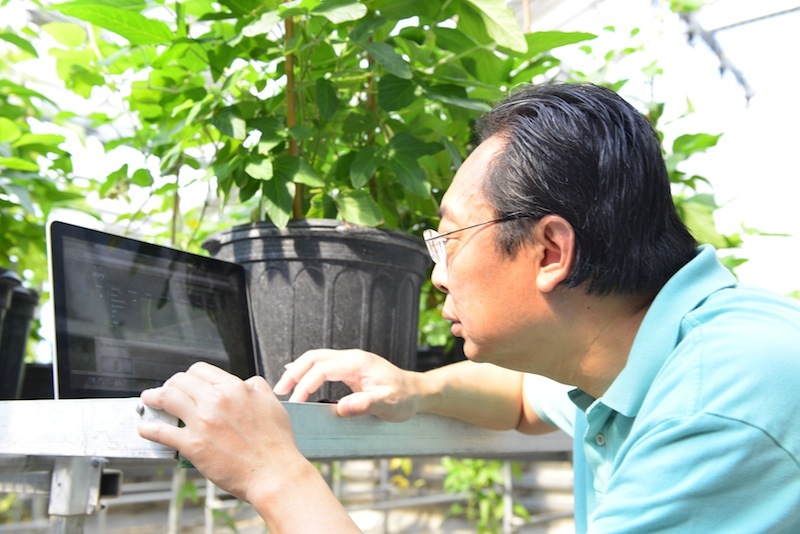 This work has implications for more crops than just soybeans: Working with collaborator Xiaohong Wang at Cornell, Mitchum’s group used their understanding of plant receptors to develop a potato resistant to potato cyst nematode. To build on the momentum of recent research, experts drafted a roadmap for the next decade of nematode research. Their goal, Mitchum said, is to address the challenge of translating these research breakthroughs into something tangible for the farmer. With support from state farmer run organizations such as the Missouri Soybean Merchandising Council, the North Central Soybean Research Program and the United Soybean Board, researchers are formulating teams that “bring together commodity, industry and university funding to develop collaborative, interdisciplinary, multistate projects,” said Mitchum. 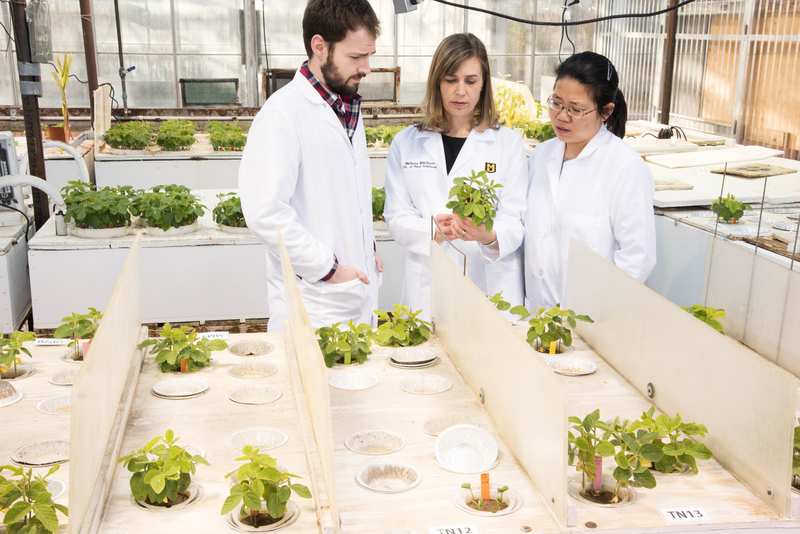 And there’s plenty of scientific firepower to advance research: MU’s College of Agriculture, Food and Natural Resources alone has more than 90 faculty studying plant science, plant genetics and other areas of agriculture-related science. The scientists’ plan for the next 10 years involves a blend of molecular research, plant breeding, population biology and outreach. 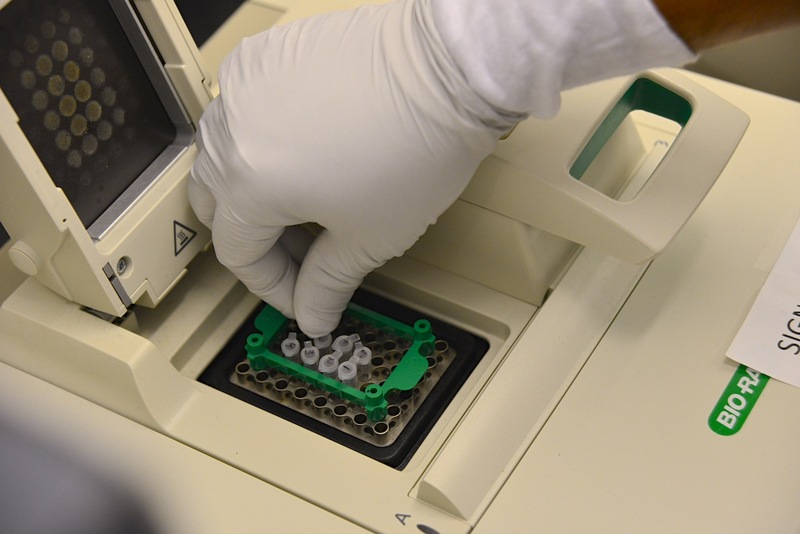 Researchers will focus on refining the existing draft SCN genome, which will help to develop a quick, inexpensive test for HG type and eventually contribute to understanding of how SCN overcomes a plant’s resistance. They’ll create an “atlas” of SCN genes researchers can use to block the pest. Updating yield loss estimates and mapping SCN distribution will also give scientists a better idea of the nematode’s national impact. Other efforts will allow breeders to incorporate new sources of resistance into commercially-available varieties, refine the use of non-host species to control SCN and develop a pipeline for creating and testing transgenic SCN-resistant soybeans. Finally, videos, webinars and training modules will help scientists, students and producers take advantage of new discoveries and techniques. Roger Meissen/Bond Life Sciences Center – Michael Gardner, Ph.D. student, Melissa Mitchum, associate professor of Plant Sciences, Xiaoli Guo, post doctoral fellow, conduct research at the University of Missouri. They investigate how soybean cyst nematode overcomes soybean resistance to identify novel approaches for management. Her lab recently received a National Science Foundation grant to continue their work on soybean protein receptors. Specific targeting of the receptors is just one potential strategy for producing new kinds of SCN-resistant plants. A second grant, from the National Institute of Food and Agriculture, will allow the lab to continue refining their understanding of how SCN proteins overcome a host plant’s defenses. To that end, Mitchum’s graduate student Michael Gardner is identifying the genetic blueprint of the different SCN types present in Missouri fields. But these breakthroughs do little good unless they then become useful tools for breeders and ultimately farmers. To that end, Mitchum and other researchers will help breeders use research results to produce soybeans with durable resistance. They‘ll also develop guides so farmers can easily incorporate new technologies and management strategies into their farms. It’s important for farmers, breeders and researchers to take a unified approach to fighting SCN, Mitchum said, because a tactic that seems successful at first could backfire. For instance, combining resistance genes in a single soybean variety could actually be harmful. “When we deploy it in the field, we select for nematodes that can overcome multiple types of resistance,” Mitchum said. A better approach might be to perfect varieties with distinctive resistance mechanisms and insure durable resistance by rotating among the resistant varieties and non-host crops. “It’s similar to taking antibiotics,” Mitchum said. “Improper use and overuse selects for resistance.” The strategic planning document should help everyone working with soybeans and SCN leverage and build upon new knowledge. Thanks to the efforts of researchers such as Mitchum, in the future SCN might be a little easier to get along with. 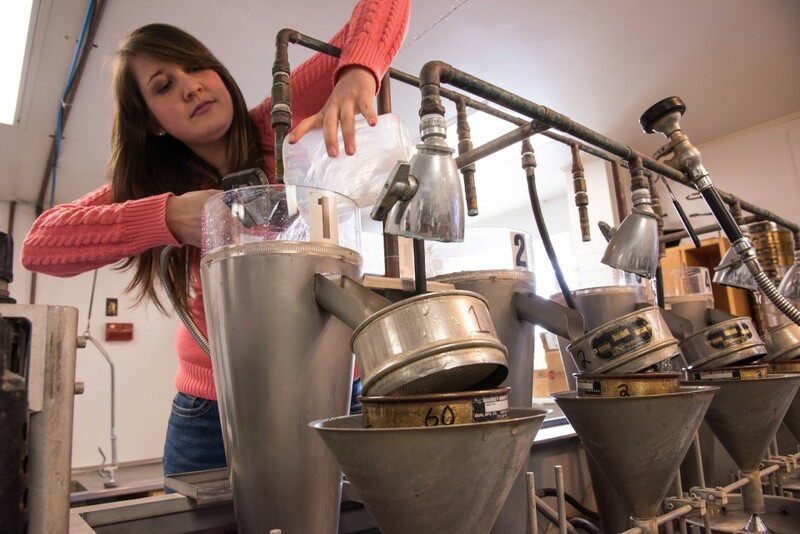 Roger Meissen/Bond Life Sciences Center – Research specialist and coordinator for the Plant Nematology Lab Amanda Howland processes soil samples for nematodes. Howland replaced Bob Heinz earlier this year. Bob Heinz spent his last day at work in December surrounded by nematodes. Heinz served as Mitchum’s research specialist and coordinator of the Plant Nematology Laboratory, where he processed soil samples, responded to growers and assisted researchers. After 35 years on the job, he’s retired, and Amanda Howland is now filling his shoes. The scientists and farmers who’ve worked with Bob over the decades thank him for his dedication and wish him luck in his retirement. And Amanda: Welcome aboard. –Vermiform Nematode Identification: Soybean Cyst? Root Knot? Lesion? 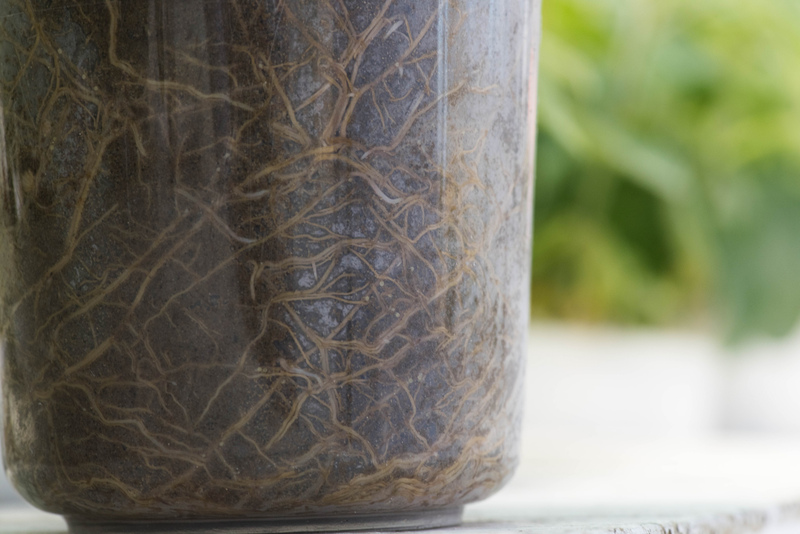 Find out what kinds of nematodes are in your fields with this test. –Soybean Cyst Nematode Egg Count: This procedure provides an estimate of the number of SCN eggs in your field. –Soybean Cyst Nematode HG Type Test: Different types of SCN have overcome various sources of soybean resistance. A HG type test will help you determine the best source of resistance for the particular type of SCN in your field. For more information, go to http://soilplantlab.missouri.edu/nematode/ or contact the Lab. What the heck is it, anyway? Epigenetics involves changes in how your genes work. In classical genetics, traits pass from generation to generation in DNA, the strands of genetic material that encode your genes. Scientists thought alterations to the DNA itself was the only way changes could pass on to subsequent generations. So say you lost a thumb to a angry snapping turtle: Because your DNA hasn’t changed, your children won’t be born with smaller thumbs. Classic. Things get way more complicated with epigenetics. It turns out that some inherited changes pass on even though they are not caused by direct changes to your DNA. 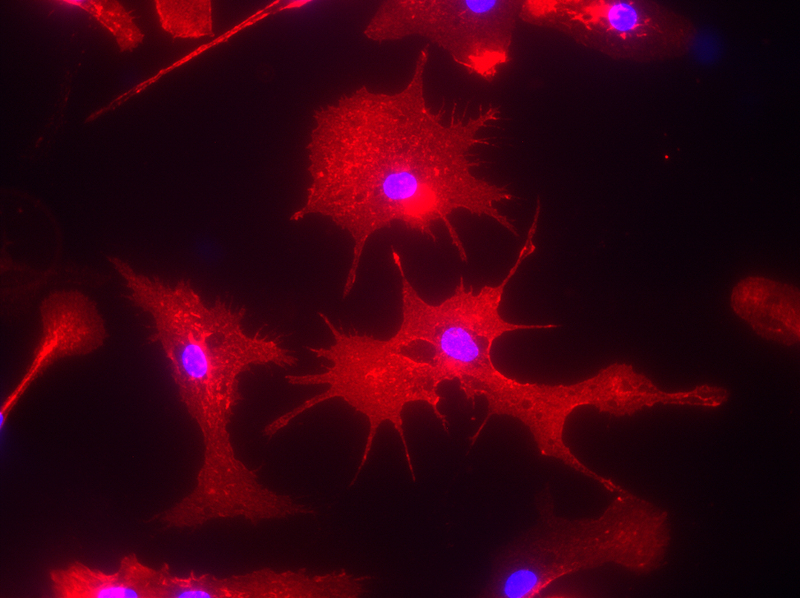 When cells divide, epigenetic changes can show up in the new cells. Getting nibbled on by an irate turtle isn’t likely to epigenetic changes, but other factors such as exposure to chemicals and an unhealthy diet, could cause generation-spanning epigenetic changes. The main players in epigenetics are histones and methyl groups. Imagine your genes are like pages in a really long book. Prior to the mid-1800s, books came with uncut edges, so in order to read the book, you’d have to slice apart the uncut pages. That’s sort of what a histone does to DNA: They are proteins that wrap DNA around themselves like thread on a spool. They keep the DNA organized and help regulate genes. That’s epigenetics. Higher level cues that tell you whether or not to read a gene. And when a scribe makes a copy of the book, they’ll not only copy all the words in the novel, but all the other stuff, too: the stuck-together pages and the margin notes. Many areas of health — including cancer, autoimmune disease, mental illness and diabetes — connect with epigenetic change. For example, scientists link epigenetic changes to neurons to depression, drug addiction and schizophrenia. And environmental toxins — such as some metals and pesticides — can cause multigenerational epigenetic effects, according to research. Once scientists and doctors decipher those processes work, they will be better equipped to treat the sick and be able to take preventative measures to help insure our health and the health of our kids. Is it epigenetics or epigenomics? As we learned from the first question, epigenetics is “the study of heritable changes in gene function that do not involve changes in the DNA sequence,” according to my trusty Merriam-Webster. Epigenomics is the study and analysis of such changes to many genes in a whole cell or organism. It’s comparable to the difference between genetics (dealing with particular pieces of DNA, usually a gene) and genomics (involving the whole genetic shebang). 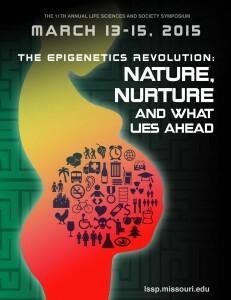 Start at this year’s Life Sciences and Society Program Symposium, “The Epigenetics Revolution: Nature, Nurture and What Lies Ahead,” on March 13-15, 2015. Speakers from all over the country will delve into the puzzles and possibilities of epigenetics. 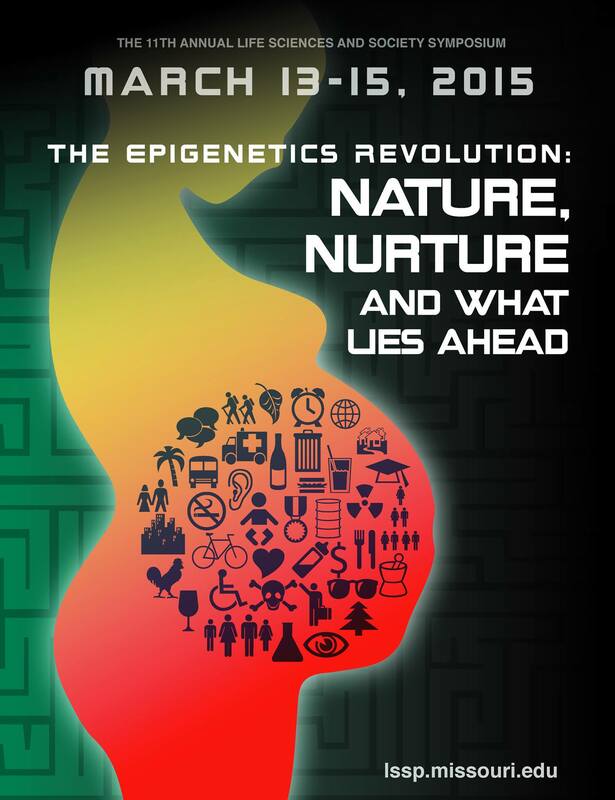 For more background, Nature magazine also created this supplement on epigenetics. Your body has an invisible enemy. One that it creates all on it’s own called oxidative stress, long thought of as an underlying cause of some of humanity’s most insidious diseases – cancer, Alzheimer’s, Parkinson’s Disease, cardiovascular disease and diabetes. Every day, our bodies are exposed to harmful free radicals known as reactive oxygen species as a result of our environment. But, when something goes wrong with this energy extraction process, cells become inundated with reactive oxygen compounds that cause oxidative stress. The search for drugs to treat the problem have been ongoing, and with a complicated problem like oxidative stress, it’s all about finding the right combination. Recent research by Bond Life Sciences Center investigator and Biochemistry Department Professor, Mark Hannink, provides a new approach for addressing the problem of oxidative stress and a starting point on developing a drug in pill form. 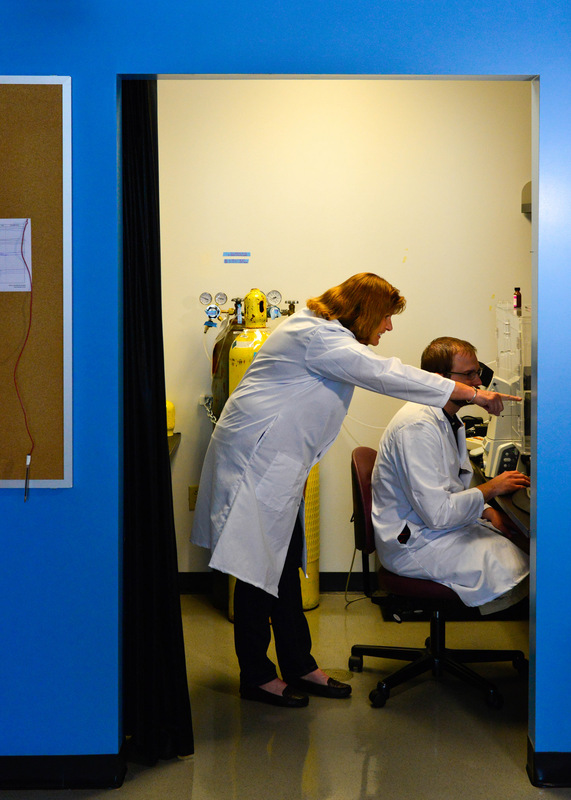 Mark Hannink and Kimberly Jasmer, a Ph.D. student in his lab, recently helped characterize a new molecule (called HPP-4382) that provides a novel way to treat oxidative stress. Their research was done in a partnership with High Point Pharmaceuticals, LLC, of North Carolina, where this new molecule was developed. Oxidative stress can cause damage to the building blocks of a cell, resulting in excessive cell proliferation in the case of cancer or cell death in the case of neurodegenerative diseases like Parkinson’s. Often, the majority of stressors are actually created inside our own cells as a byproduct of how our cells extract energy from the food that we eat and the air that we breathe. Specimen of protein are prepared for an experiment in a lab at the Bond Life Sciences Center at the University of Missouri. Most simply, oxidative stress is an imbalance that happens when the body uses oxygen to produce energy. Superoxide, a “promiscuous and nonspecific” compound produced as a byproduct of this process, is a highly reactive molecule that can damage DNA and other cellular components, Hannink said. The superoxide molecule is a “free radical.” That means it’s especially promiscuous and reacts with many different types of cellular molecules, leaving destruction in its wake, he said. That damage can lead to a long list of problems, including cancer or neurodegenerative diseases like Parkinson’s disease. In response to oxidative stress, the cell produces protective “anti-oxidant” proteins, which help remove the harmful reactive oxygen species and minimize damage. But a heavy anti-oxidant response could be dangerous, too. The bottom line: it’s about maintaining a fine balance between “oxidants” and “anti-oxidants”. A drug that corrects the imbalance of oxidative stress could one day have wide applicability. Jasmer developed a test to measure how specific compounds altered gene expression. The genetic response to oxidative stress has both an “ON” switch and an “OFF” switch. Using this test, Jasmer determined how each compound affected specific genetic switches and, in turn, how the response to oxidative stress is regulated. This test helped identify which molecules might be promising candidates for treating oxidative stress, leading them to one in particular that seemed to have the desired properties: HPP-4382. But creating effective drugs is a long process of trial and error. Once molecules have been identified that show efficacy in lab-based assays, scientists try different combinations to increase their potency and drug-like properties, and High Point is currently testing other molecules that behave like HPP-4382. This research was published in PLoS One in July and was funded by High Point Pharmaceuticals, LLC. 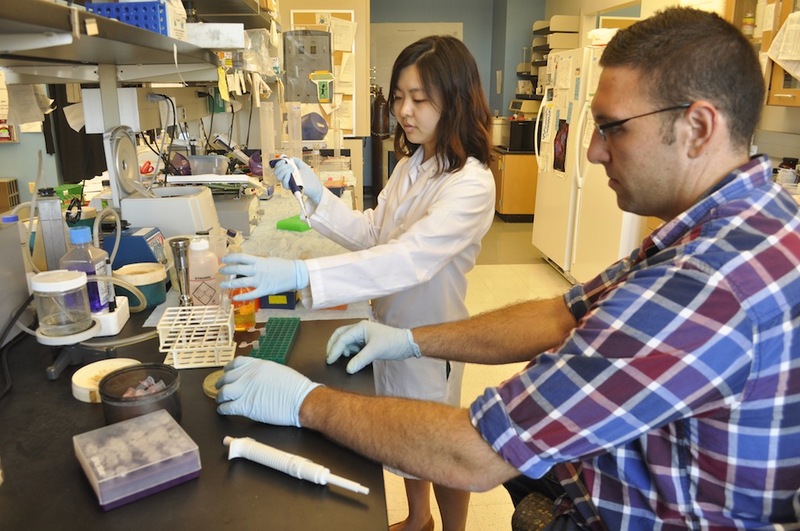 Graduate students Yuleam Song and Dan Salamango inoculate a bacteria culture in Johnson’s lab. The inoculation takes a small portion of a virus and multiplies the sample, allowing researchers to custom-make viruses. Modern science has found a way to turn viruses —tiny, dangerous weapons responsible for runny noses, crippling stomach pains and worldwide epidemics such as AIDS— into a tool. Gene therapy centers on the idea that scientists can hijack viruses and use them as vehicles to deliver DNA to organs in the body that are missing important genes, but the understanding of virus behavior is far from exhaustive. Marc Johnson, researcher at the Christopher S. Bond Life Sciences Center and associate professor of molecular microbiology and immunology in the MU School of Medicine, has been building an understanding of viral navigation mechanisms which allow a virus to recognize the kind of cell it can infect. Johnson’s research specifically explores the intricacies of the viral navigation system and could improve future direction of gene therapy, he said. 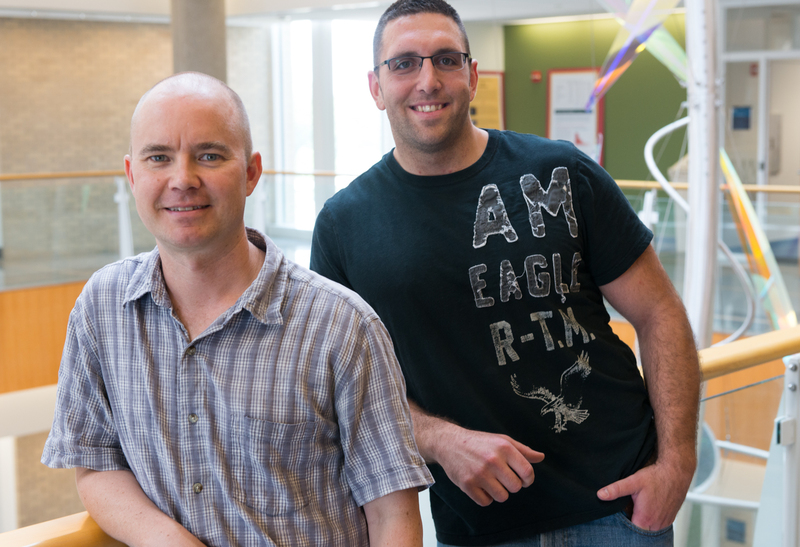 Marc Johnson (left) with Dan Salamango, a graduate student that works in his lab. The lab does important research on the basic function and mechanisms of viral navigation and transport. Conceptualized in the 1970s, gene therapy was developed to treat patients for a variety of diseases, including Parkinson’s, leukemia and hemophilia (a genetic condition that stops blood from clotting). To treat disease using gene therapy, a customized virus is prepared. A virus can be thought of as a missile with a navigation system and two other basic subunits: A capsule that holds the ammunition and the ammunition itself. The viral genetic material can be thought of as the missile’s ammunition. When a cell is infected, this genetic material is deployed and incorporated into the cell’s DNA. The host cell then becomes a factory producing parts of the virus. Those parts assemble inside the cell to make a new virus, which then leaves the cell to infect another. The capsule is made of structural protein that contains the genetic material, and the navigation system is a protein that allows the virus to recognize the kind of cell it can infect. Gene therapy uses viruses to solve many problems by utilizing a virus’ ability to integrate itself into a host cell’s DNA; to do this successfully, researchers need to provide a compatible navigation component. In the body, viruses speed around as if on a busy highway. Each virus has a navigation system telling it which cells to infect. But sometimes if a virus picks up the wrong type of navigation system, it doesn’t know where to go at all. But this doesn’t always work because of incompatibility among certain viruses, he said. Johnson and his lab are working to understand what makes switching out navigation proteins possible and why some viruses’ navigation systems are incompatible with other viruses. “I’m trying to understand what makes it compatible so that hopefully down the road we can intelligently make others compatible,” Johnson said. Johnson creates custom viruses by introducing the three viral components—structural protein, genetic material, and navigation protein—to a cell culture. The structural protein and genetic material match, but the navigation component is the wild card. It could either take to the other parts to produce an infectious virus, or it could be incompatible. Johnson uses a special fluorescent microscope to identify which viruses assembled correctly and which didn’t. A successful pairing is like making a match. 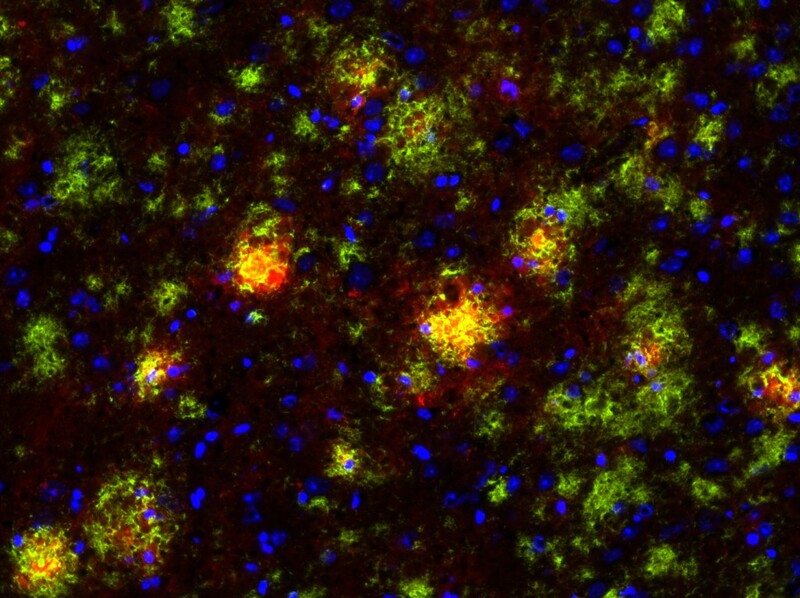 If a navigation protein is programmed to target liver cells, it’s considered a successful pairing when the virus arrives at the liver cell target location. The scope of gene therapy continues to widen. Improved mechanisms for gene therapy, and greater knowledge of how a navigation protein drives a virus could help more people benefit from the vehicles viruses can become. Johnson uses several high-profile model retroviruses, including human immunodeficiency virus (HIV), which affects an estimated 35 million people worldwide each year, according to the World Health Organization. Understanding nuances of HIV in comparison to other viruses allows Johnson to pick out which behaviors might be common to all retroviruses and others behaviors that might be specific to each virus. Johnson said his more general approach makes it easier to understand more complex viral features. Lauren and Claire Gibbs share contagious laughter, ambition and a charismatic sarcasm. Both are honor students at Shawnee Mission East High School in a Kansas City suburb. They also share a neuromuscular disease called spinal muscular atrophy (SMA), designated as an “orphan disease” because it affects fewer than 200,000 people in the U.S. However, the landscape for individuals with SMA is quickly changing with the development of new drugs. More than 7 million people in the United States are carriers (approximately 1 in 40) of the so-called “rare” neurodegenerative disease, SMA. Lauren,17 (left) and Claire, 16 (right), say their shared SMA diagnosis has strengthened their relationship and presented them with opportunities to travel and share their experiences. | Photo provided by the Gibbs family. The success of therapeutics in lab experiments provides a new layer of hope for individuals and families living with the disease. 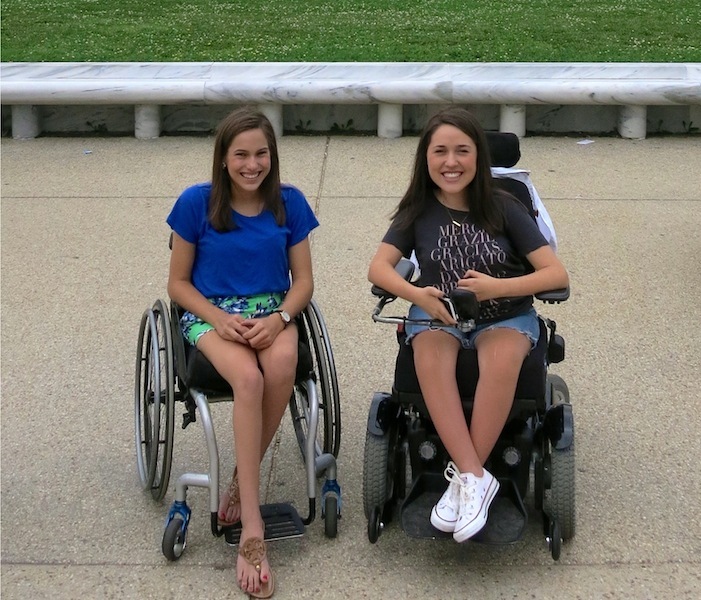 Lauren, now 17, fit the criteria for SMA Type III, while Claire, now 16, showed symptoms of a more severe manifestation of the disease, SMA Type II. Lauren and Claire Gibbs were diagnosed on the same day. Despite their numerous similarities, the biggest disparity between them is mobility. Claire uses a power wheel chair while Lauren is able to use a manual chair. It’s not unusual to see Lauren being pulled along in her chair, playfully hanging onto the back of Claire’s motorized chair. Lauren is participating in a clinical trial with ISIS-SMNRx a compound developed by Isis Pharmaceuticals, a leading company in the antisense drug discovery and development based in Carlsbad, Calif. Lauren feels that she has gained stamina and a greater ability to walk — a feat that wasn’t routine just five years ago. Prior to the trial, Lauren was able to walk only for short distances. 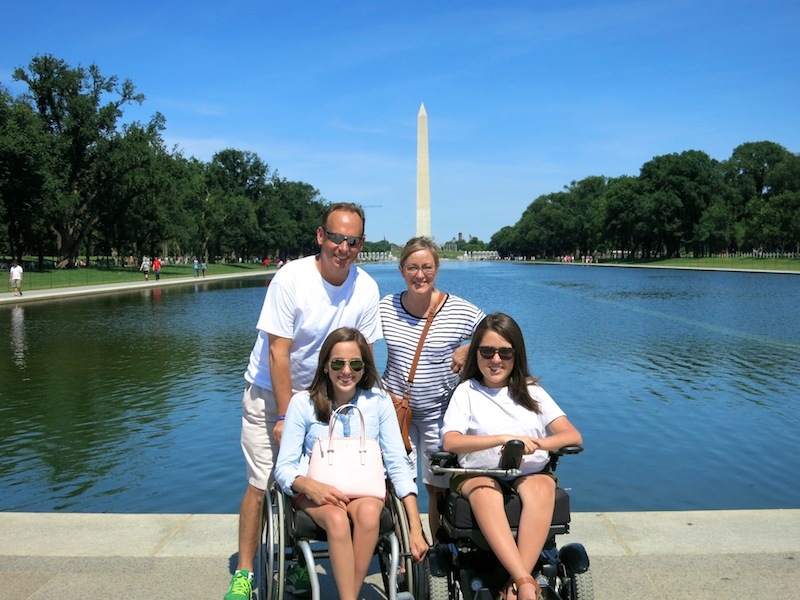 Tim and Natalie Gibbs with their daughters Lauren, 17 (left) and Claire, 16 (right) in Washington D.C. The Gibbs have been visible advocates in the fight for a cure for spinal muscular atrophy. | Photo provided by the Gibbs family. A new experimental drug developed by researchers at the Christopher S. Bond Life Sciences Center, is bringing hope to individuals with the orphan disease affecting one in 6,000 people. 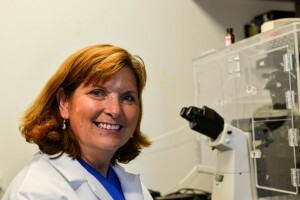 Christian Lorson PhD, investigator in the Bond Life Sciences Center and Professor of Veterinary Pathobiology at the University of Missouri, has been researching SMA for seventeen years and has made a recent breakthrough with the development of a novel compound found to be highly efficacious in animal models of disease. In April, a patent was filed for Lorson’s compound for use in SMA. Lorson’s therapeutic, an antisense oligonucleotide (a fancy name for a small molecule therapeutic that falls under the umbrella of gene therapy), repairs expression from the gene affected by the disease. The research was published May in in the Oxford University Press, Human Molecular Genetics. 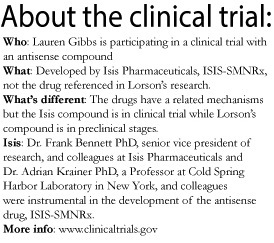 The drug developed by Lorson’s lab is conceptually similar to ISIS-SMNRx already in clinical trial developed by Isis Pharmaceuticals and a team of investigators at Cold Spring Harbor Laboratory headed by Dr. Adrian Krainer. Antisense drugs are not a new practice, but their wide-spread adoption seems to be on the cusp with recent success stories like the commercialization of an FDA-approved antisense compound produced by Isis in 2013 called Kynamro for the treatment of homozygous familial hypercholesterolemia, a high cholesterol disorder that is passed down through families. The National Institutes of Health has listed SMA as the neurological disease closest to finding a cure. Discoveries made by the Lorson Lab have contributed significantly to current scientific understanding of the disease mechanisms and to the advances being made in finding an effective treatment for SMA. These antisense therapies work because of the genetic makeup of SMA —the genetics are incredibly clear: a single, specific gene called Survival Motor Neuron 1 (SMN1) has been pinpointed as the cause of SMA. SMA is a neurodegenerative disorder, meaning muscles become weaker over time due to sick or dying neurons. These neurons become less functional because of low levels of the SMN. Remarkably, the disease can be reversed in animal models of disease if the nearly identical duplicate gene, SMN2, can be “turned on” to compensate for low SMN levels. Lorson’s antisense oligonucleotide therapeutic provides incredible specificity because it hones in on a specific genetic target sequence within SMN2 RNA and allows proper “editing” of the RNA encoding the SMN protein. The strategy is to “repress the repressor,” Lorson said. The SMA-specific defect lies at the RNA step – the “cutting and splicing” of important RNA sequences does not happen efficiently in SMN2 RNAs because of a several “repressor” signals. The new, antisense oligonucleotide seems to know how to get the job done. The existence of such similar genes as SMN1 and SMN2 in humans creates a rare genetic landscape lending itself especially to a therapeutic development for SMA. Humans are unique in this duplication — something Lorson calls a “genetic happenstance” that, on an evolutionary scale, may as well have happened yesterday. Why humans have developed this redundant gene is unknown. 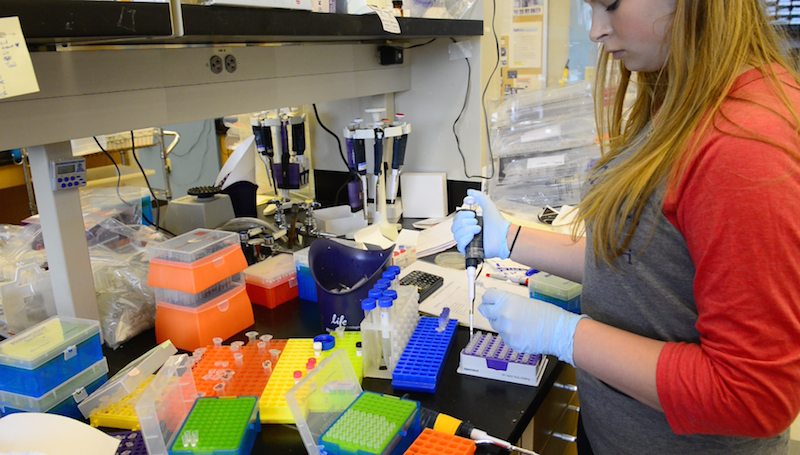 Thalia Sass, an MU biological sciences major, genotypes samples in the Lorson Lab where spinal muscular atrophy is researched. In addition to the developments of new SMA therapeutics, Lorson and his lab sought to answer an important biological question concerning the disease: When can a therapeutic be administered and still show some degree of efficacy? Lorson’s research found that the earliest administration of a treatment provided the best outlook— extending the survival of laboratory mice by 500 to 700 percent, “a profound rescue,” according to his research published in April in the Oxford University Press, Human Molecular Genetics. A near complete, 90 percent rescue was demonstrated in severe SMA mouse models. But even when the therapeutic was administered after the onset of SMA symptoms, there was still a significant impact on the severity of the disease. In Lorson’s study it’s definitive that the earlier a therapeutic can be administered, the better the outcome for individuals with SMA. On June 2, Lauren and Claire Gibbs attended a routine, annual rehab appointment with Dr. Robert Rinaldi, MD, division of pediatric rehabilitation medicine and attending physician at Children’s Mercy Hospital in Kansas City, Mo Dr. Rinaldi is not associated with the Isis clinical trial. The appointment was like a reunion among close friends — Rinaldi began seeing Claire and Lauren Gibbs 16 years ago, the first year that he began working at the hospital and when the girls were one- and two-years-old, respectively. The girls did all of the routine tests —measuring strength of grip and breathing, and assessing range of movement with the occupational and physical therapists. A little later, Rinaldi sat with Natalie Gibbs, Lauren and Claire’s mother and a relentless advocate for advancement in SMA awareness. Typically the muscles of individuals with SMA deteriorate over time, but together they inspected the definition of a new calf muscle on Lauren’s left leg. For a young woman with Type III SMA — this means she can walk for short distances with little discomfort but still uses her wheel chair a majority of the time — Lauren’s new calf muscle is a remarkable achievement. As Lauren continues to participate in the ISIS antisense therapy clinical trial, her conditions continue to improve dramatically, even with the late administration of the therapy — in her case, 16 years after her diagnosis and onset of effects. Lauren believes her ability and stamina for walking have increased significantly. “Quite frankly my jaw almost hit the ground when she stood up — the change was that impressive to me,” Rinaldi said. Rinaldi, also the co-director of the Nerve and Muscle Clinics at the hospital, had last seen Lauren two years ago. He said the Lauren he saw during a routine rehab appointment in June was like seeing a new person altogether. Lauren Gibbs is the first of Rinaldi’s patients to have participated in the ISIS clinical trial. The progress has rewarded the Gibbs family’s advocacy in SMA awareness and they’ve been able to set new goals they didn’t imagine were possible when the diagnoses for Lauren and Claire were made. Natalie Gibbs is a long-time member of Families of SMA and is currently on their Board of Directors. The organization Families of SMA is currently providing funding to Lorson to advance this research area. “We’re able to see first hand — and our physician who has been watching them for sixteen years has seen — that everything we’re doing in the clinical trials is really making a difference,” Natalie Gibbs said. Over the course of their daughters’ lives, Natalie and her husband Tim Gibbs say a shift in momentum has accelerated the technology and research toward finding a cure for SMA. Simple actions like walking, swallowing and breathing are the result of a complex communication system between cells. When we touch something hot, our nerve cells tell us to take our hand off the object. This happens in a matter of milliseconds. This hyperspeed of communication is instrumental in maintaining proper muscle function. Many degenerative diseases affecting millions of people worldwide result from reduced signaling speed or other cellular miscommunications within this intricate network. Michael Garcia, investigator at the Christopher S. Bond Life Sciences Center and associate professor of biology at the University of Missouri, conducts basic research to answer fundamental questions of nerve cell mechanics. “In order to fix something, you need to first understand how it works,” Garcia said. Garcia’s research illuminates relationships between nerve cells to find factors affecting function. His goal is to provide insight on fundamental cellular mechanisms that aren’t fully understood. Garcia’s research has been funded partly by the National Science Foundation and National Institutes of Health. Technological advancements have made it possible to better understand disease development in the human body to create more effective treatments. Alas, a scientist’s work is never finished— when the answer to one question is found, ten more crop up in its wake. Garcia’s research, which appeared in several journals including Human Molecular Genetics andthe Journal of Neuroscience Research initially sought to shed light on the neuronal response to myelination, the development of an insulating border around a nerve cell, called a myelin sheath, which is critical in rapid communication between cells. Garcia’s early research disproved a long-standing hypothesis concerning this cellular feature. Mammals’ nervous systems are uniquely equipped with myelination, which has been shown to increase conduction velocity, or the speed at which nerve cells pass signals. Low velocity is often associated with neurodegenerative diseases, so research exploring why could later have application in therapeutic technology. In addition to myelination, cell size makes a big difference in conduction velocity — the bigger the nerve cells, the faster they can pass and receive signals. Garcia’s findings disproved a hypothesis that related myelination to this phenomenon. The hypothesis, published in a 1992 edition of Cell, claimed that myelination causes a cellular process called phosphorylation which then causes an increase in the axonal diameter (width of the communicating part of a nerve cell), leading to faster nerve cell communication. Garcia found that myelination did cause an increase in axonal diameter, and myelination was required for phosphorylation, but that the two results were independent of one another. To narrow in on the processes affecting axonal diameter, Garcia identified the protein responsible for growth. Garcia followed earlier work, showing that one subunit controls whether there is growth at all with myelination, by identifying the domain of this protein that determines how much growth. After clarifying this part of the process, a question still remains: If not to control myelination, why does phosphorylation happen? 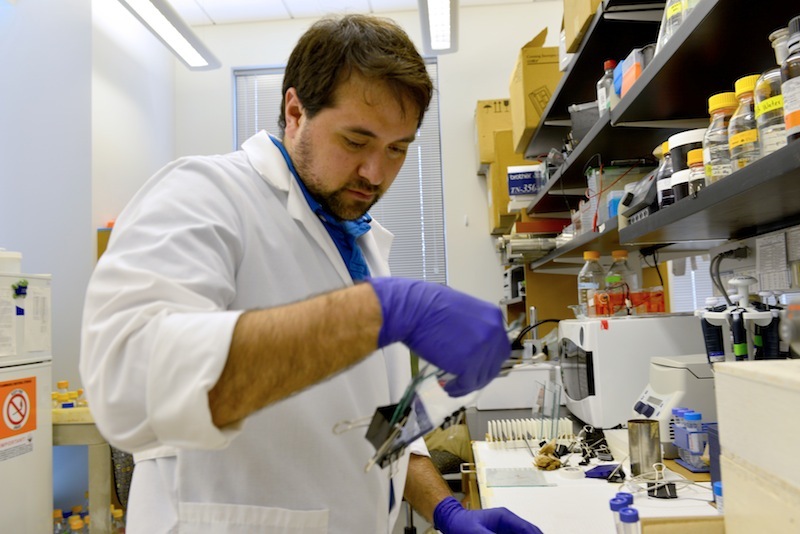 Jeffrey Dale, a recent PhD graduate from Garcia’s lab, said current research is in part geared toward finding a connection between phosphorylation and a process called remyelination. Remyelination could be key to new therapeutic approaches. When a cell is damaged (as in neurodegenerative disease) the myelin sheath can be stripped away. Remyelination is the process a cell goes through to replace the myelin. Imagine you have a new wooden toy boat, painted and smooth. If you take a knife and whittle away all the paint and then repaint it—even exactly how it was painted before—the boat is not going to be as shiny and smooth as it was before. This is how remyelination works (or rather, doesn’t). When nerve cells are damaged, the myelin sheath is stripped away and even after the cell rebuilds it, the cell can’t conduct signals at the same speed it was able to before. “If you can learn what controls myelination, maybe you can improve effectiveness of remyelination,” Dale said. Garcia said it is possible that revealing the mechanics involved in phosphorylation could lead to better treatments. In context of neurodegenerative diseases, the question why don’t axons function properly might be wrapped up in Garcia’s question: In healthy cells, why do they?